WooCommerce – is a WordPress plugin, which lets you create CMS-based online stores. This is one of the most popular eCommerce systems: over 350 thousands of websites listed in the Top Million Rating are created with WooCommerce. Extensive spread of the system’s popularity is triggered by at least two factors: simplicity of management typical for WordPress and its plugins as well as expendability. You are welcome to add extensions to WooCommerce, which give the web master advanced web store management options. The easiest WordPress Shopping Cart. Thousands of Online Store designs. WooCommerce has narrow specialization – web store creation. However, there are no restrictions, when it comes to this niche: you can develop any kind of platform, sell products and/or services. WooCommerce enjoys special popularity with small and medium business owners. One of the major reasons is free plugin availability, which lets you create an eCommerce website without any special financial investments. Ease of management is another important factor – no special coding skills are needed to work with the extension. Large companies also use WooCommerce to create online platforms, but they frequently choose alternative solutions in the long run. If you have a look at the statistics of plugin use in the Top 10,000 websites, then the positions will be somewhat lower here. However, they will still be quite serious – every tenth large online store is built with WooCommerce. Anyway, the plugin is quite easy to use for entrepreneurs and small/medium business owners, who strive to minimize the investments on the initial stages of eCommerce website development. As the company grows and increases the revenue rate, WooCommerce does not require any replacement: the plugin can easily cover the needs of large platforms. Usage statistics of the service speaks in favor of this fact. Suits for small business owners. Set up categories and filters to simplify the search. Accept orders and online payments. Track orders and user behaviour via the use of analytics tools – both integrated and external. Manage payment, shipping and tax settings depending upon the location an order was made from. Set up discount programs, special offers and drawings. Demonstrate similar and top selling products to users via widgets. Form customer loyalty by means of applying useful online mailouts etc. To make the plugin function flawlessly, a website should be stored on quite a powerful hosting. Virtual solution will also work well for a small online store, but it should support PHP 7, MySQL 5 and higher, have unlimited traffic, free disk storage space from 1 GB and 128 MB of RAM. The optimal product assortment that won’t affect website performance constitutes 2,000-3,000 positions. Smart optimization and use of the server that is able to withstand high loads makes it possible to increase the number of products up to 5,000 items. If you need more, it would be reasonable to consider using specialized CMS for eCommerce. Yoast SEO, which includes add-ons to control metadata of product cards. AMP with WP and WooCommerce extensions used to create faster versions of important website pages. WooCommerce Multilingual tool applied to create multilingual websites. This is just a small amount of plugins, which extend standard WooCommerce functionality. If you can afford investing extra budget, the selection will become even more impressive due to the availability of paid solutions offering extra eCommerce website management tools. To effectively optimize a WordPress-based website for the search engines, Yoast SEO plugin is used most often. 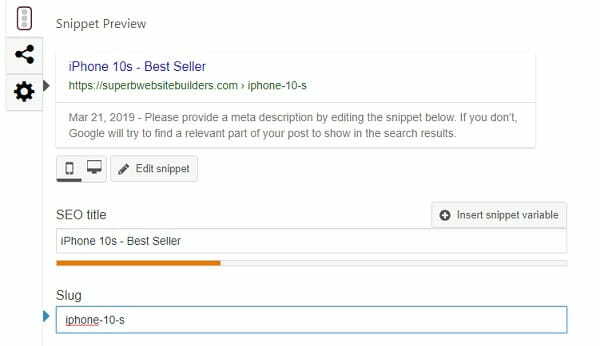 While you install the eCommerce extension, you should add a module that integrates a standard SEO optimization block into each product page and lets edit the metadata. It is recommended to fill out only the title and the description. It’s allowed to ignore the keywords – the search engines don’t consider them during indexation. Yoast SEO is also needed to set up the metadata, which will define the way website links will look when published on social network website pages. Set up of human-friendly URLs is the next step. Proper domain name display is generally set up during the first WordPress launch. However, when it comes to the WooCommerce plugin, the “product” prefix is added to the URL. That’s not a problem from the point of view of optimization – the only thing affected is the aesthetic feeling. You can get rid of the prefix in two ways: either through the paid plugin or with the help of free Permalink Manager Lite extension, which requires extra set up and manual editing of earlier added products. Web store optimization requires the creation of faster versions of the main pages and product cards. The AMP plugin with add-ons for WordPress and WooCommerce is used for this purpose. You won’t go without any plugins at all, because the basic system complectation and eCommerce plugin don’t contain any SEO and website promotion tools. 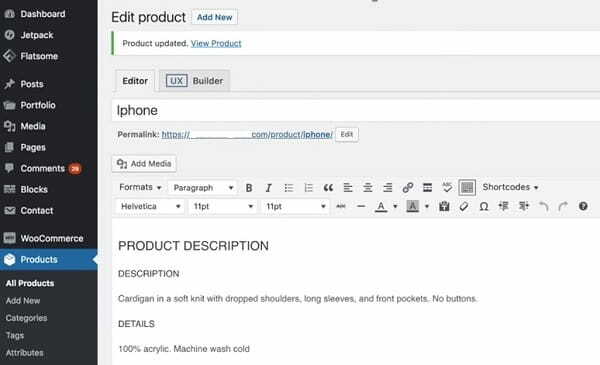 The eCommerce plugin is compatible with all the templates, but some themes are actually displayed with mistakes. To avoid the unneeded problems, look for templates that ideally work for eCommerce. For greater convenience, you can use the catalogue found at the WooCommerce website – there is a special Theme Store section there. If you use a standard WordPress library to look for templates, type the “WooCommerce” search inquiry in the corresponding field. This will help you find the templates, the developers of which ensure their complete compatibility with the plugin. It’s possible to use other template sources for WordPress as well. When it comes to WooCommerce web store design customization options, they are similar to those of any other WordPress website. The platform itself allows creating and editing menus, adding widgets to web pages as well as making the interface of separate website pages with the Gutenberg block editor that is introduced in WordPress 5.0 version. As to the extra options, we can single out the add-ons available for the themes in the “Design” section. By using them, you can add the “Buy” button and the shopping cart icon, for example. WooCommerce templates come with system files, which describe the design of product cards, shopping cart, order placement pages etc. You can also set them up with regard to your taste, but you’ll additionally require programming skills or budget to hire the specialists. More than 500 store themes. CSS and HTML editing options. The Support Service encompasses the assistance with product installation, application and configuration. If there are any bugs, they will be responsible for fixing them in the shortest time possible. Likewise, if you encounter any problems with plugin set up, you can also contact them during the general support hours specified at the website. All the queries are generally handled within 24 hours, but sometimes the actual response time may vary depending upon the technical issues and time of the day/day of the week. To get in touch with the support team, you can fill out the Contact Form. WooCommerce also has an extensive community forum and the FAQ section you can browse to find answers to lots of widespread questions. The plugin also comes with the list of Customer Support extensions you can integrate into your web store to provide clients with all kinds of support services. The most popular of them include PayPal Checkout, LiveChat, Amazon and eBay, WooCommerce Bookings, Help Scout and Freshdesk. These extensions are both free and paid. You can install WooCommerce for free from the standard catalogue in the WordPress admin panel or download it from the official website and upload to the server as the archive. Free license doesn’t prevent from using the extension to create projects of different sizes. The plugin does not have any restrictions as to the product assortment, payment options or traffic – it will remain free both for web stores with three product positions and for online hypermarkets. To extend the basic WooCommerce functionality, you can install other plugins. They can be paid, but you can find the alternative with a free license without any problems. However, you won’t be able to build a web store without any budget at all. There are two must-have expenditure objects here – just like in any CMS. These are hosting and domain purchase. The final cost depends upon the domain zone, web store size and hosting provider. For example, a website with a small product assortment will cost you around $3-5 per month. Speaking about hosting, WordPress recommends its number one official hosting provider – Bluehost. The system ensures easy one-click WordPress installation, 24/7 customer support, free SSL Certificate connection and lots of other options provided in terms of the system plans. The latter include three plans, namely Shared, VPS and Dedicated Hosting. The cost of the plans correspondingly constitutes $2.95, $17.58 and $70.33 per month. Additionally, there is the 30-day money-back guarantee for users, who are not satisfied with the plans they have chosen for some reason. ✘ high cost of paid WooCommerce extensions. Among WooCommerce disadvantages, it is possible to point out high server load, which makes users purchase more expensive hosting to avoid web store access problems as well as orientation on the Western market. Just like any other free solution, the plugin does not have regular official customer support. To solve the problems you have, you need to access thematic forums. However, there is the tech support center, which helps solve technical nuances users may encounter during the system use. Another disadvantage is high cost of paid WooCommerce extensions. The plugin itself is available for free, but if you need to add advanced options to it, the chances that you’ll need to pay for them are quite high. Sometimes, the prices are really expensive. For example, the extension, which allows automatically removing the “product” prefix from the URL, will cost you $119. You can do that at no cost, but you’ll have to manually edit previously added products in this case. If the number of these products is rich, it will take you long to make the required edits. Compatible with all WordPress versions. WooCommerce – is a free eCommerce plugin, which offers complex approach to the organization of online sales. Right after its integration, your WordPress website will turn into a web store. Based on the required functionality, you might need installation of extensions, but you can also start with basic WooCommerce options. However, the use of WordPress and eCommerce plugin combination is not always reasonable. To launch small websites, for example, you may benefit from using website builders, which provide all the required sales-related features and tools out-of-the-box. They can also be used to launch large-scale projects, but WooCommerce still looks a more preferable solution in this niche.